"I joined Broadway Infosys Nepal for Advance PHP. Faculties here has real time work experience and that's the plus point and the instructor here are highly experienced . They show patience to clear all the doubts that comes in students mind. We can take the classes repeatedly and also take back-up classes. No restriction are there with the teaching methodology here. Totally, a good institute for learners,fresher and job seekers. 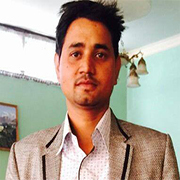 By gaining knowledge from Broadway now I am in a senior position of PHP developer in one of the reputed IT Company in Nepal"